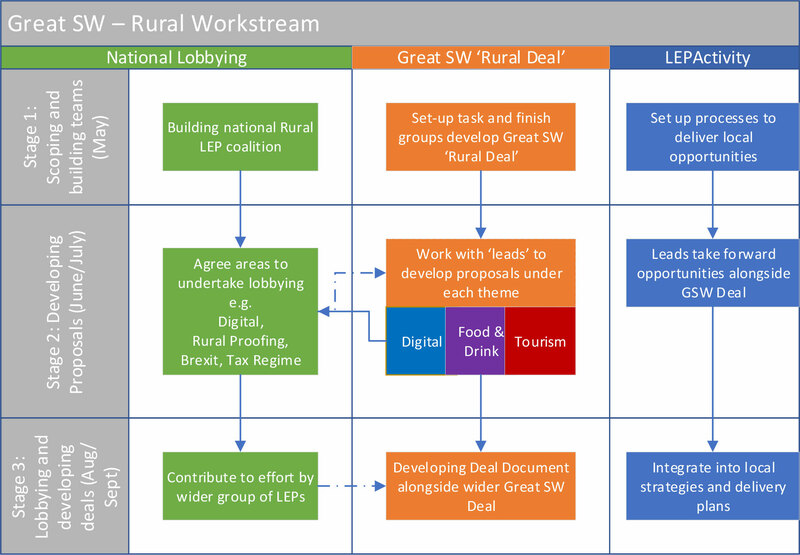 Building on the work of the Great South West partnership, four South West LEPs – Cornwall and the Isles of Scilly, Dorset, Heart of the South West and Swindon and Wiltshire – commissioned an independent enquiry to identify opportunities to stimulate rural productivity and growth. This resulted in the South West Rural Productivity Commission Report which was published in October 2017. The report received a positive response from national and regional stakeholders, and was mentioned in the Government’s Industrial Strategy as good example of collaboration to address shared challenges. Since then, these four Great South West LEPs have been working to agree the next steps in implementing the recommendations of the report with GFirst and West of England LEPs taking an active interest. The LEPs have been reviewing the findings of the report; discussing them with Government and local partners and considering the options for progressing recommendations in three spatial workstreams: nationally, regionally and locally. Naturally some agendas will be important across all three but this approach will help us focus on the ‘golden threads’ of opportunities. National issues – Where we will have to work with other LEPs across the country to take forward issues that are of national significance. Key issues anticipated as being national are: broadband and mobile investment budgets, rural proofing of other national budgets and Brexit related opportunities and challenges. Regional issues – Where there are benefits to work collectively regionally in the south west to develop a Great SW ‘Rural Deal’. Key opportunities will be: making the most of broadband and mobile investment, regional opportunities for productivity and prosperity arising from tourism and food and drink. Local issues – Where we can support the progress of agendas specific to each LEP area. For example, each of our National Parks have come up with proposals on how they can pilot post-Brexit funding regimes. The first phase is to refine the scope of the workstreams and build partnerships to develop and deliver them and work is progressing already. We are currently supporting the establishment of a working group of all the Rural LEPs in the country on the back of this work. The group will consider the above plan and agree the key issues to focus our national influence with Government. Business-case development and a tactical plan to engage with Government are the key next steps. The commission found huge potential for economic growth if key opportunities are seized and challenges addressed. This new report shows examples of tangible projects that will deliver benefits throughout the community. The commission was set up to hear and review evidence from a range of sources and stakeholders to frame the south west response to the Industrial Strategy and forthcoming DEFRA 25 year plans for ‘food, farming and fisheries’ and ‘environment’; Draw out opportunities to drive rural productivity improvements; Understand functioning between rural and urban distinctions; Secure Government support for specific initiatives in the autumn statement; Influence national and local policies where appropriate to improve rural productivity. The commission collected evidence through an open call for written evidence from April to June, followed by five formal evidence hearings across the four LEP areas. There are genuine concerns that our rural communities are spiralling downwards towards ‘fossilised retirement villages’ unless Government and local leaders take prompt action. Local and national policy must move away from the ‘one size fits all’ approach that fail to recognise that rural areas are different. Brexit has the potential to shake the foundations of our rural economy – providing either a much needed boost or sudden economic shock. Now is the time for action if we are to reap the benefits in line with the commission’s recommendations. The Chair of the South West Rural Commission, David Fursdon, said: “The Rural economy is integral to raising the productivity of the south west, and this report highlights how rural prosperity can be tackled alongside urban growth, to bring about prosperity for all in very part of the economy. “We’ve looked at what sectors are involved, what opportunities there are for growth – and what barriers are faced – including issues around housing, jobs, transport, skills and demographics. “If we are looking at the need for vital infrastructure to underpin growth, we need to look no further than digital connectivity, which must be the priority for all parts of our rural areas. “We explored what the implications of Brexit might be, as well as the potential for developing innovative clusters to harness any opportunities for the future, including the potential for companies “scaling up”. “We’ve heard from a broad range of people and organisations that they share a strong belief that helping the rural economy is the key to raising the productivity of the south west. Our report shows how this could work and give it the attention that it deserves. “A vibrant rural economy is crucial to the success of the Heart of the South West. HotSW has a strong rural and agricultural core, making a significant contribution to the UK’s production and export of foodstuffs. With 2 national parks and 2 coastlines, we need to build on our distinctive assets to create a sustainable economy. The commission reports to the chairs of the four LEPs that have committed to the process, and is chaired by David Fursdon, Chair of the SW Rural and Farming Network and is supported by nominated representatives from each LEP area. David Fursdon (Chair) – David runs a rural business in Mid-Devon and was previously a partner in a SW rural firm as a rural surveyor. He also chairs Beeswax Dyson Farming Ltd and the SW Rural and Farming Network and serves on the Board of the National Trust and the Duchy of Cornwall rural committee. Other previous relevant roles include President of the Country Land and Business Association (CLA); Commissioner of the Crown Estate; English Heritage and Affordable Rural Housing Commission, Chair of SW Board for 2012 Olympics, chair of Future of Farming review and Member SWRDA Board. Catherine Mead DL (Cornwall and the Isles of Scilly) – Catherine is the CEO of Lynher Dairies Ltd, makers of Cornish Yarg. Since joining the company 20 years ago, Catherine developed the business exponentially and 10 years ago acquired full ownership. The business now exports all over the world and was awarded Regional Manufacturing Company of the Year in 2015 and Catherine was awarded the Women in business Award in 2011. Prior to this, Catherine was a director of a London based advertising agency, with clients including the Home Office, Department of Transport and Department of Health. She is Chair of Jamie Oliver’s 15 Cornwall, a Trustee of the Duke of Cornwall’s Benevolent Fund and Vice Chair of the Specialist Cheese Makers Association. Luke Rake (Dorset) – Luke is the principal and Chief Executive of Kingston Maurward college (a specialist land based college). An Oxford educated zoologist, Luke’s career has held roles in both schools and colleges including 10 years as vice principal of Hartpury College in Gloucestershire. Luke sits on the National Data Management Advisory Board for Further Education working with senior partners in Government bodies and until gaining his position at Kingston Maurward college was the senior convenor of the Landex National Curriculum Group. In his spare time, Luke enjoys the great outdoors and was previously a member and training officer for the Longdown Mountain Rescue Team based on the edge of the Brecon Beacons. Paul Redmore (Wiltshire) – Paul is currently the Farm Manager of the Neston Park Estate, a 600Ha mixed organic estate, with various rural commercial ventures including farm shop, restaurant, cheese/ice cream production, joinery and film sets! Paul studied Agriculture at Seale Hayne Agricultural College and then worked on farms in Canada, New Zealand and Australia before returning to the UK. He has worked on various farms and Estates across the South of England, including 6 years as Bicton College Farm Manager, where he also sat on the college Governing body. He has sat on the Board of Directors of Organic Seed Producers Ltd and Organic Arable Marketing Group Ltd for 2 years. Paul has a strong interest in integrating new technologies into farming systems, practical on-farm research, rural start-ups and education and training young people for the rural economy. However, we also recognise that rural/urban data is not always available at this small geographical scale and sometimes it is necessary to use the rural/urban local authority classification, which also considers some urban areas as Hub towns (with populations of between 10,000 and 30,000). These Hub towns have met statistical criteria to be considered hubs for services and businesses for a wider rural hinterland and their populations are therefore classified as effectively rural for the purposes of local authority classification. This entry was posted in Active, Projects in our area. Bookmark the permalink.